If I am lucky, I usually score breakfast in bed twice a year – on Mother’s Day and my birthday (both of which usually fall in the same week!). I usually need to do some pre-planning (such as stock up on croissants etc) to ensure a lovely breakfast. Of course, now that Sarah is very capable in the kitchen, she often whips up something special. 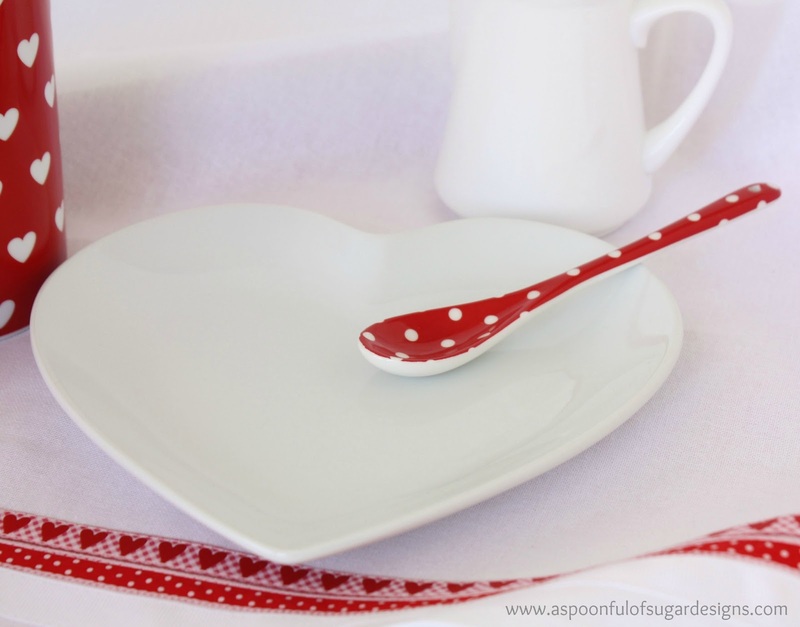 When I was shopping at Target last week, I spotted some sweet Valentine’s inspired coffee mugs and heart shaped plates. 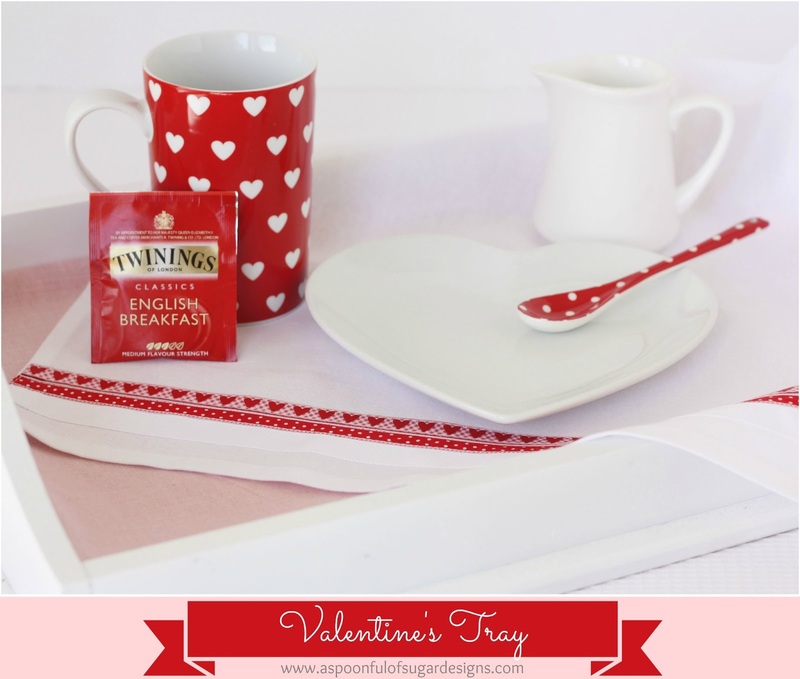 This got me to thinking that a Valentine’s Day breakfast in bed would be a great way to start the day. To make it really easy for Mr Sugar, I have the tray all decorated and ready to go. I gave some plain white cotton napkins, a Valentine’s make-over. 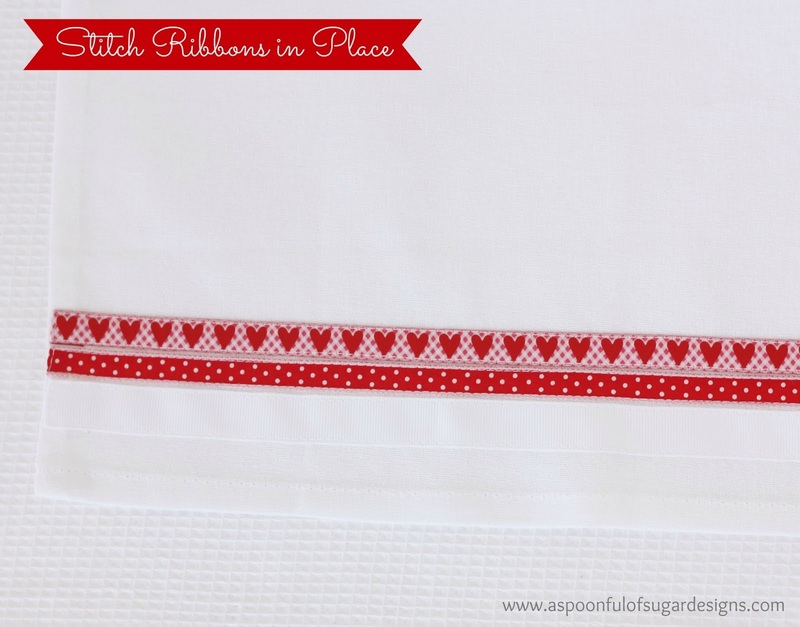 I raided my ribbon stash and found three co-ordinating ribbons – white grosgrain, red polka dot, and gingham hearts. I cut the ribbons so that they were the 1 inch longer than the width of the napkin. The ribbons were pinned 1/2 inch from the bottom edge of the napkin and stitched in place, approximately 1/8 inch apart. At each end, 1/2 inch of ribbon was tucked under. 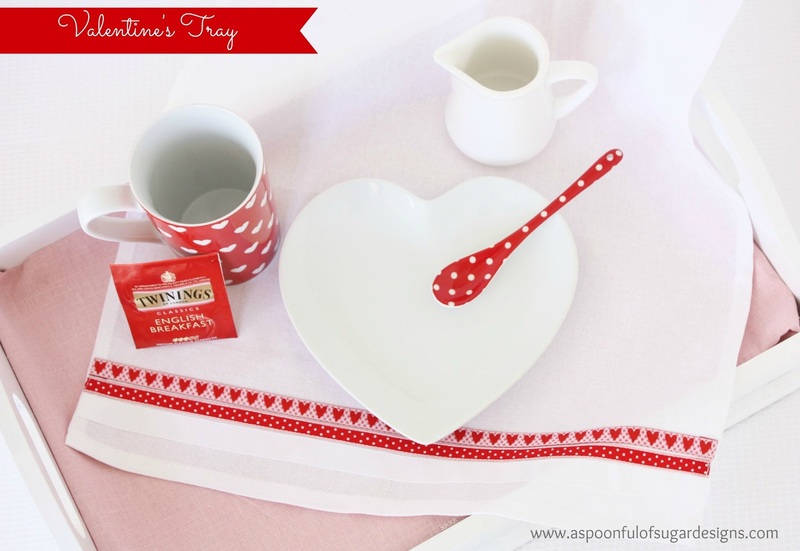 A white tray was lined with a pink tea towel and the Valentines napkin. The new Valentines coffee mug and plate are all washed and ready for brekkie. We found a sweet red polka dot porcelain spoon at Minipla (in Japan) which will be perfect for spooning some jam on our croissants. It is the little things that show someone you care. Setting a pretty tray for breakfast in bed makes it extra special. Disclaimer: This is not a sponsored post but we are Brand Amabassadors for Target. Soooo adorable. 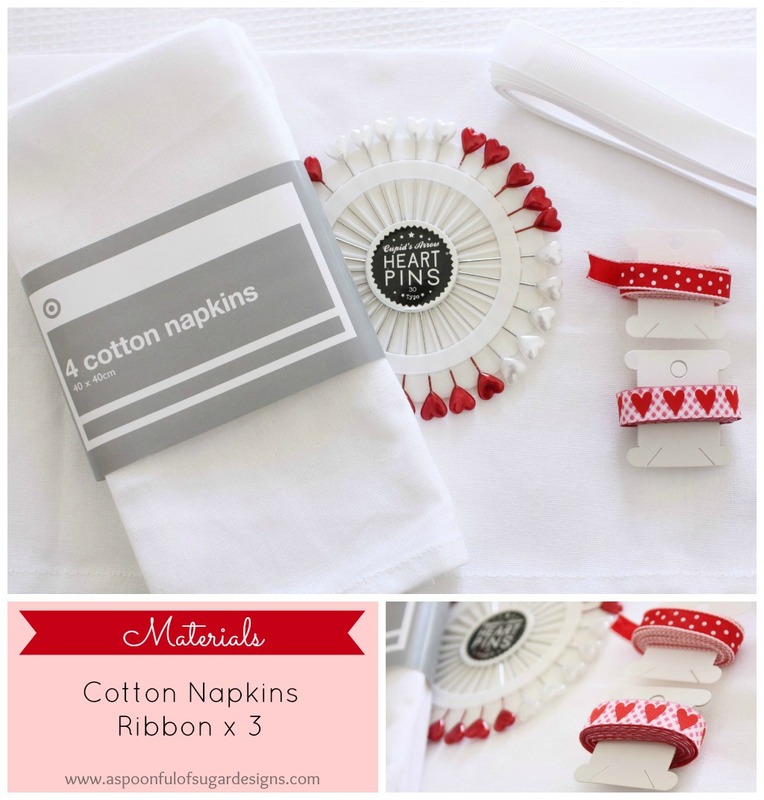 I love the color matching and the way you transformed the white napkins with the ribbons. Quite the way I like it – and so unique. Very pretty setting you’ve made there. Sometimes we have to take these things into our own hands. I pinned this to Pinterest as Im sure many people will love it as well. How lovely to get breakfast in bed, your ideas make it even more cozy. 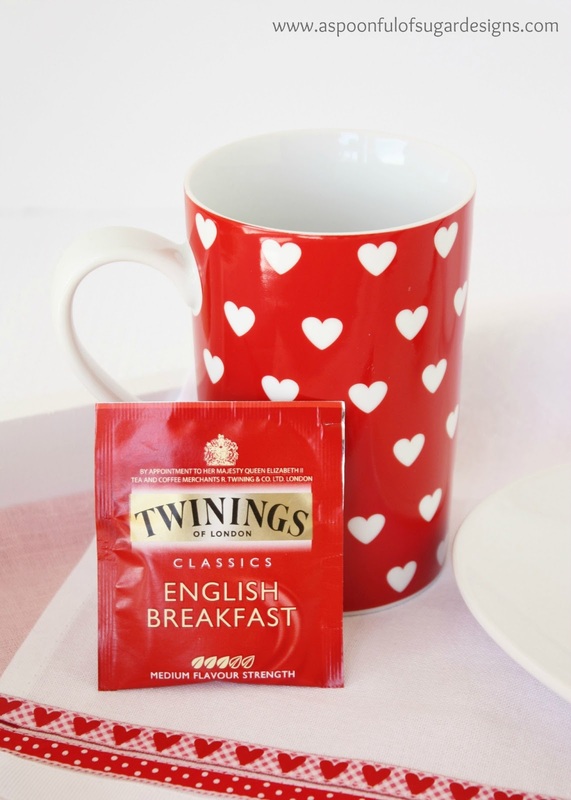 Just LOVE the red hearts mug, it would be perfect for my collection! My neighbor makes the best English Tea Scones I’ve ever had. I could see one on that plate with some red sugar sprinkled on top and strawberry jam. Yum. And beautiful. 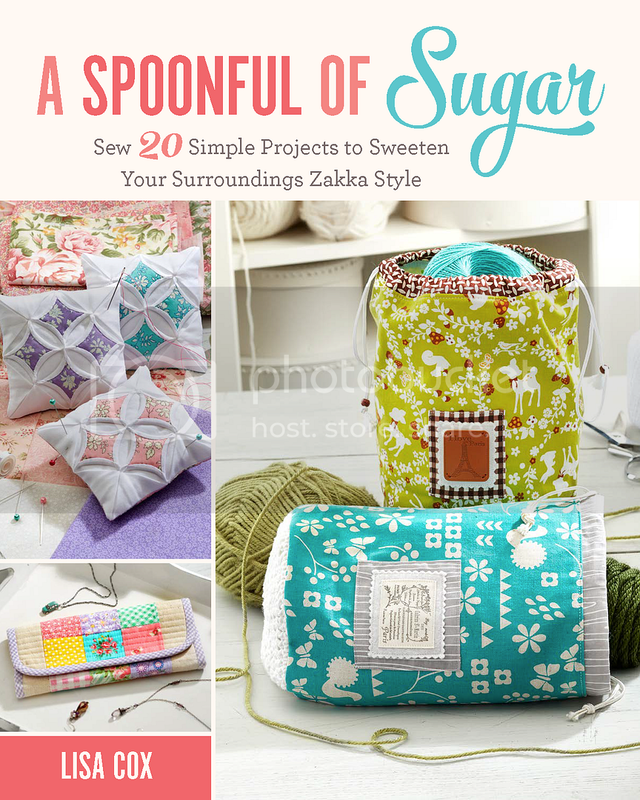 Mr. Sugar really has everything laid out for him – he will be in big trouble if he doesn’t deliver! !